Many people are often afraid of the ocean, rightfully so at times. The strong waves and currents can be ominous but if we are able to look past that we can see how wonderful it can actually be. How harmonious and in sync all the creatures are with their complex ecosystems is humbling. The ocean has never been a stranger to me or my family. My grandfather and father both had been Navy Divers. As I got older not only did I admire the tough job they had but also the skills they acquired after so many years of it. This inspired me to one day also be able to work in or near the ocean. I had always wanted to become dive certified since I was little. He would always give me tours around the Dive School he taught at and administrated in Florida and I was always left in awe when he would tell me the amazing things he and his divers were tasked with. When I found out that I had the opportunity to get my open water dive certification with MCC, I was ecstatic. I told my family, friends, and basically anyone I came in contact with the month before. After my finals, I focused all my attention on preparing for the big test at the end of the week and told myself that by Sunday, the last day of training, I would finally be a certified open water diver. My anxiety and anticipation had turned into determination. “Time to study” I told myself as I rolled out of bed. As I sat down I realized what a big day it was, I was finally going to take my diving test that I had been studying for. As I read the book, I refreshed my memory on safety precautions, buoyancy, and even found myself doing math. Pre-test jitters had caught me once again, as they always had before a big test. When I arrived to the dive shop I started flipping frantically through the book to absorb as much information possible and making sure I had all the appropriate materials. An hour later a small group of us had taken the test and we had all passed(YAY). Little did I know that was the least difficult challenge we would face that weekend. On day two, the group met at Anderson Air Force base to complete our confined water training. When we arrived, we completed six laps around the pool, treaded water and then we were on to the real stuff. As we submerged ourselves in the water I found it strange to breathe under water with a regulator. All my life I had been taught to hold my breath under water and now I was doing the exact opposite! I found myself holding my breath in intervals until I finally became familiarized. 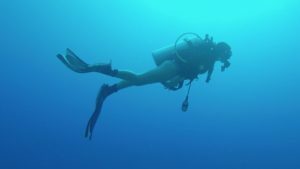 When we were finally comfortable breathing, we began practicing things like buddy breathing, hovering, and controlling our buoyancy with our BCDs. After we completed our pool work we were off to practice some skills at the beach. As we headed there I was excited to be out of the pool and finally in the ocean. When we arrived at the beach we got our gear and headed out. We completed multiple tasks including clearing our masks, towing our buddies, and swimming under water without masks. As I watched each person take their turn one by one I also allowed myself to gain a new perspective of the ocean. When I was in the water before snorkeling, I had always looked at the ocean from above and now I was able to look at it from below. On the last day of training, we got an early start to San Luis to finish some of our training before our boat dive. When I arrived to the site I immediately noticed how choppy the waves were. Though they were a bit discouraging I was ready to dive in(literally). We practiced taking our gear off and clearing our masks as well. After a long morning in the water we set off to lunch at the dive shop. Everyone fit in like it was where they were meant to be. Despite everyone having different backgrounds we could all connect and appreciate our similar interests. When we all finished lunch, it was finally time to get on the boat. After getting our gear checked we got ready to do our final open water dives. Everyone got on the boat and we were off to Barracuda Rock and Crevis. As we passed by Spanish steps and Gab Gab, I took in the beauty of the beautiful limestone walls that towered higher than buildings. 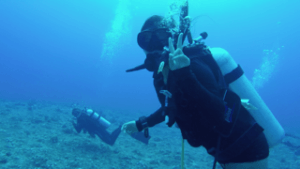 When we arrived, we set up our gear and one by one we jumped off the boat… When we emerged, we were all open water dive certified!